tracieclaiborne.com: don't wait until you're "in the mood"
don't wait until you're "in the mood"
I saw this on Pinterest today and it so resonated with me. I'm doing well with keeping my life balanced: house clean, working when I should, not procrastinating, making creating a priority. When I read this, I realized this is the core of what my problem was before. I would rarely clean or create until I was "in the mood." I would always work whether I was in the mood or not because I get paid to work and it has to be done. I've been disciplined about it when I was not disciplined about anything else. In fact, my daughter paid me the highest compliment she's ever paid me today. She said, "One thing I admire about you is that you're good at you what you do. You always get the job done." Well there goes my heart pitter-patter. Day made! Best kid ever award for this one please! So nice to know someone's noticing my hard work! But housework and creative work, I will be the first to admit, up 'til now, got done when the mood hit me or company was coming. That's no way to live! If I want to balance everything in my life, I have to keep everything on an even keel. Too much of anything, even a fun thing like the internet or a must-do thing like work, can throw everything else off balance. I need to throw "take care of my health" into my list of priorities and I'm working on that. 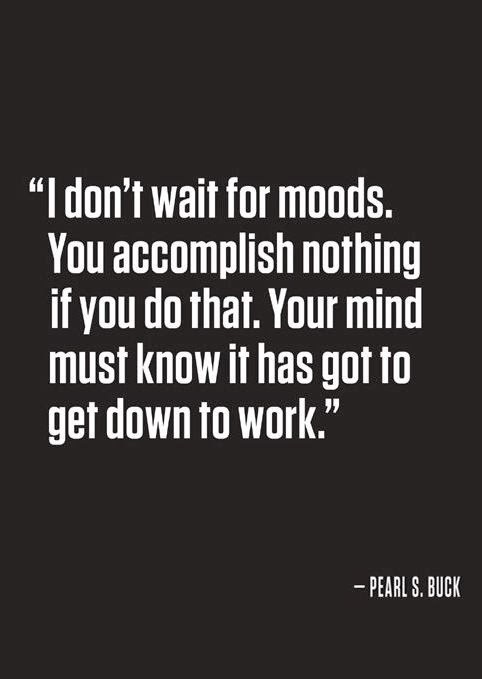 I've been guilty of just worrying about that when the mood hits me too. Don't anyone feel like I'm not enjoying my life because truly I am. Having everything balanced makes life so much more enjoyable!! Knowing I have scheduled time to do nothing is a big plus too. Makes it easier to do my housework. As far as the "get down to work" part goes...I enjoy creating once I sit down and start so that's not really work. But for the sake of this quote, I'll call it work. I'd rather end the quote with "let's get down to the important things in life." But hey, it's not my quote. That quote is just so profound to me, I had to share. It's now my new desktop image. You can hardly wait to write until you are in the inclination. On the off chance that you held up until you were in the state of mind, it would take for eternity. You need to take a seat, don't think back until you have written a whole draft. I have tried several attempts to write my essay on an unique topic. I am not certain that I can set it up well. So I think it is ideal to pick any writing service to purchase essay on the web. Help me with your thoughts for picking the best essay writing service provider through essay writing service reviews.